Since its first appearance nearly 6,000 years ago, educational technology has given birth to some of humanity’s finest inventions. Without it, we wouldn’t have historical records, textbooks (digital or print), search engines, or social media. We’d be doing sums on our fingers and toes and drawing maps in the dust with sharp sticks. We’d be generating tools without advancing our collective knowledge. Like technology, educational technology is much more than computers and networks. In fact, a quick look at its etymology shows us that it refers to three concepts at once: the Latin educare, meaning to rear or train; the Greek techne, meaning art, skill, craft, or the way, manner, or means by which a thing is gained; and logos, Greek for word, or expression by words. While technology translates as “words or discourse about the way things are gained,” educational technology adds a specification: “things” as skills or information, acquired through training. As an instrument of learning, edtech is equal parts process and practice. The Association for Educational Communications and Technology defines educational technology as “the practice of facilitating learning and improving performance by creating, using, and managing appropriate technological processes and resources.” We also know that as a process or resource, it’s any system or tool that serves learning, from pencils and printers to written communication itself. The evolution of educational technology has been, in turn, both highly predictable and entirely surprising. While it’s likely that no one had imagined written communication very long before they tried it out, other developments have been a long time coming. For example, in his 1980 book Mindstorms, Seymour Papert predicted that computers would help students gain “a sense of mastery over a piece of the most modern and powerful technology and establish an intimate contact with some of the deepest ideas from science, from mathematics, and from the art of intellectual model building.” Papert had been working on a programming language called Logo that allowed students to manipulate graphics on a screen in order to boost their mathematic reasoning skills. The more edtech evolves, the easier it is to imagine future possibilities. Now that wearable technology has entered the picture, we can’t help envisioning actual implants that record everything a person sees, hears, and even feels. We could be just a few short decades away from total-immersion technology that turns game-based learning into role-playing reality. However the future of educational technology unfolds, it’s important to note the way it’s shaped history so far. Doing so will help educators and students visualise its potential more fully and use it in ways that aid future generations. 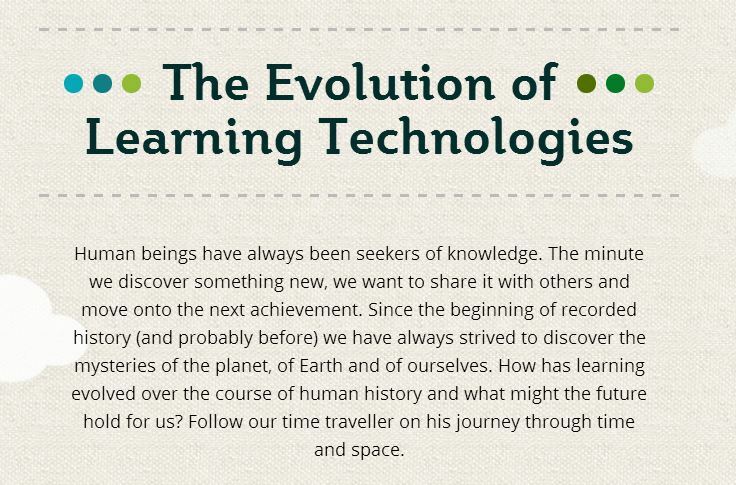 To help educators and learners get a glimpse of the technological changes education has been through, InformED has put together a fun and interesting interactive infographic detailing when technologies have been invented and adopted into people’s learning and development. See the infographic below or visit the interactive page here. Educational technologies are contributing enormously to democratization of knowledge. I was President and CEO of Indira Gandhi National Open University (IGNOU) New Delhi, India. IGNOU has over 4 million students on its roll. It has enabled millions to acquire education who would have been left out without a new, more accessible and cost effective system of education. Even today, with the advances in communication and information technologies, millions of people are denied access to education because of their socio- economic background, gender, geographical background or disabilities. Acquiring knowledge and skills is human right and society has an obligation to facilitate it. I am convinced that rapid advances in communication and information technologies will help people to acquire knowledge and skills to improve the quality of their lives.